T1D Could Look Like Me... You... Or One Of Your Loved Ones | Life, Sport and Diabetes - An everyday look at my life with type 1 diabetes. This month marks the start of Diabetes Awareness month, which is a very important month in the diabetes calendar because it's an opportunity to raise awareness amongst people who might not normally have much to do with the condition. But as we know, type 1 diabetes has no cure, it isn't selective about whom it targets, we don't know the cause of it and we know that diagnosis is on the increase. All this means that although diabetes might seemingly have nothing to do with you today, it still could affect you tomorrow or someone that you love or care about. Which can also be said about type 2 diabetes which is currently showing even more prevalence in people being diagnosed, especially in the UK. This Diabetes Awareness month the Juvenile Diabetes Research Foundation (JDRF) has come up with a great way to not only spread awareness of type 1 diabetes. But to also dispel a few of the myths that can often be associated with the condition. JDRF have done this by creating an online app that enables you to, via a link to their website, upload a picture of yourself or a loved one. 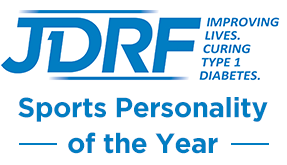 But with their graphic over the top of it, which shades the colour of the image in blue (the diabetes association signature colour), and this is accompanied with the wording T1D Looks Like Me. Which is shorthand for type 1 diabetes looks like me, and pictured below you can see my version. People have then been sharing their photos on social media and changing their profile pictures on popular networking sites, which also helps spread the message and get people talking about diabetes. I decided to upload a picture of me sprinting because it still surprises me, that other people are surprised that I participate in elite sport through competitions and training, despite having diabetes. So in the text that accompanied my picture that I put out on my social media, I also wrote about the fact that diabetes never used to look like me, until I was diagnosed with type 1, and as such it could look like anyone. I wanted to convey the positive message that rather than stereotyping what people with diabetes look like and what they can and can't do. Let's focus on what we can do and what can be done for others in raising awareness of the signs and symptoms of the condition- thinner, tired, toilet thirsty. So that diabetes diagnosis does not signify the end of a life, but the start of a new one- which for me I know that I'd never of had (in a positive way) as a result of being diagnosed with type 1 diabetes.